Versatile colors and thick pile. I bought 4 of these rugs in the same pattern, but different sizes for my son's new house. I bought the small 2 x 3 for a back door, 3 x 5 for the front entrance, 2 x 12 runner, and large 10 x 14 for the family room. The rugs contain all the most common decor colors, so they go with everything. My son has a sage green hall, yellow-tan family room and pinky taupe living and dining rooms, and the rugs go beautifully with them all. They are THICK, and look much more expensive than they cost I did buy good quality rug pads to support them. I subtracted one star from the 10 x 14 because it appears to have some hard kernels of glue left in the pile that can be felt when walked barefoot on it. That would not change my purchase decision. I would have spent thousands otherwise for such beautiful rugs. Very pleased. "mom"
Received this rug in 2 day, thanks for great turn around and delivery. Exceeded my expectations. The quality is very good; pile is thick and very resilient. 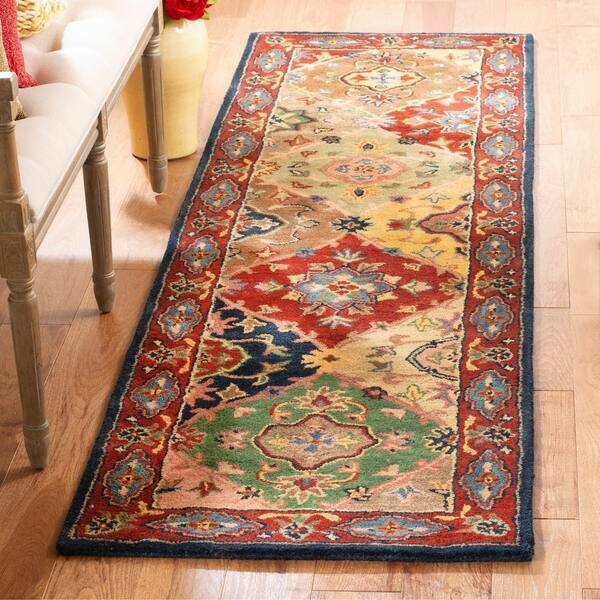 Colors are authenticate and do not look cheap, in fact, the rug looks a lot more expensive than what I paid. I was so pleased, I ordered 2 more area rugs the same day I received this rug. The 2 additional rugs I ordered were as good as this runner. I do need to mention, all these rugs were wool. This area rug is thick and has vibrant colors. Would go for several hundred dollars in a local store. The quality is immensely better than what i had previously...it feels luxurious to my toes. Because I like the colors. "Smaller size in this pattern?"